How much does SEOCHARGER cost ? 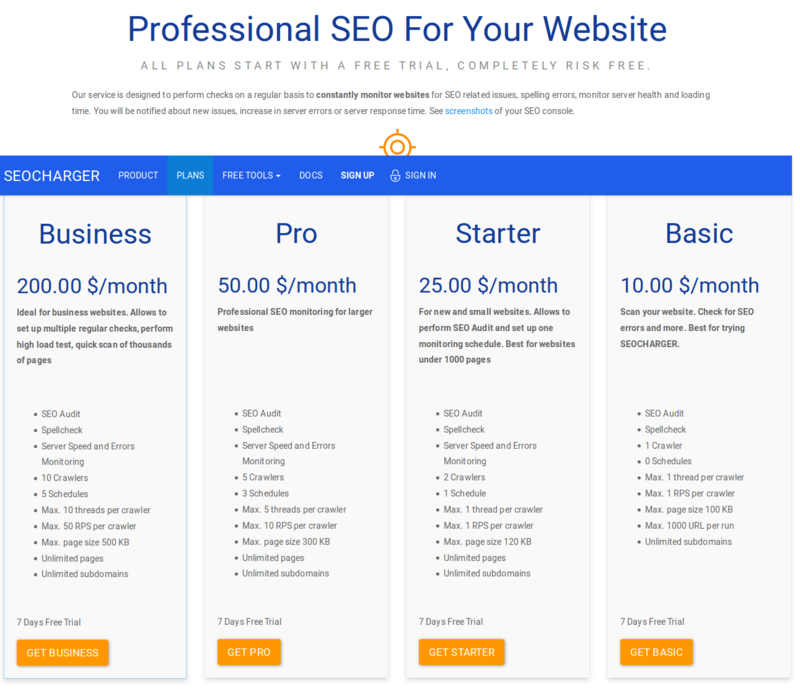 The pricing for SEOCHARGER starts at $10.0 per month. SEOCHARGER has 4 different plans such as - Basic at $10.0 per month, Starter at $25.0 per month, Pro at $50.0 per month and Business at $200.0 per month. Scan your website. Check for SEO errors and more. Best for trying SEOCHARGER. The way to find hidden SEO problems. Comments: I trusted to content manager and developer, when they built our two sites. I can check many aspects of our product: design, markup, business logic, and I checked. Both sites started their life more than three years ago. They passed through several features updates, also we have content updates every day. I can't say that we has problem with indexing our content by google, but it was hurt to see our positions in index. Several times discussed about this problem with content manager, we tried change authors, with developer we rotated positions of content blocks, but nothing helped. All colleagues, advised me to hire professional SEO master. But, my business is not big, and even one developer is sensitive for the budget of our company. But when I searched SEO specialists and looked to their astronomic salaries, I found several services which automate many things from SEO world. I tried few of them, mostly only those which give trial periods. Finally I chose seocharger.com service. I checked my site, and was surprised how much SEO fails was detected. Service also gives tips on how to fix this issues, and we fixed. After few month we see results, most our positions in index were growing week by week. We also established periodical checking, which is done by this service, and now I get alerts about SEO errors immediately after content manager has created new post or developer has deployed new release - and this is awesome feature. So, I strongly recommend this service for everyone who want avoid SEO errors on own sites.